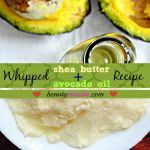 Soft & Silky Shea Butter and Olive Oil Mix for Skin & Hair - beautymunsta - free natural beauty hacks and more! 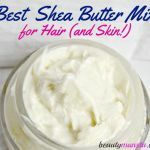 The shea butter and olive oil mix is one of the most loved shea butter mixes in the natural beauty world and I can tell you that it’s intensely nourishing and moisturizing. It’s really very good for dry chapped skin and dry hair. Natural hair will love this shea butter mix as it’s lubricating and locks moisture and healthy fat into dry curls, kinks, coils and waves! 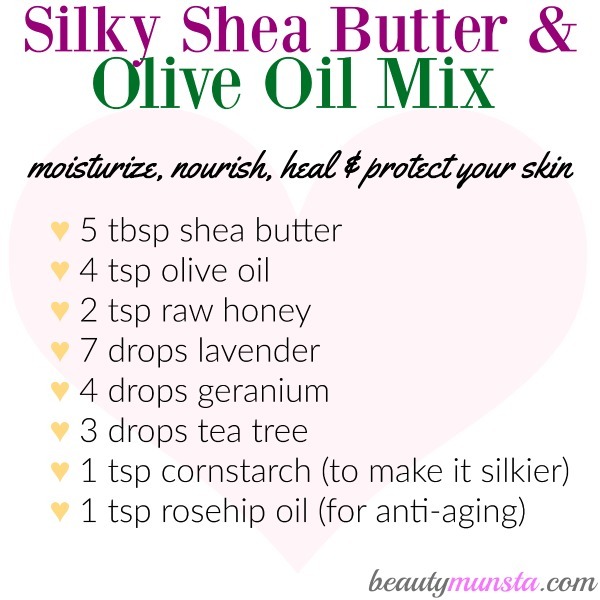 This shea butter and olive oil mix is one great DIY for winter, to keep your skin looking healthy. You’ll also love this shea buter butter lotion with beeswax for the dry and cold winter skin protection. ➝ Olive Oil – Olive oil is rich in essential fatty acids like oleic and linoleic acids that nourish and lubricate dry skin. It’s also rich in vitamin E, a powerful antioxidant that fights premature aging by warding off free radicals. It also keeps skin supple and hydrated. ➝ Raw Honey – Being a natural humectant, raw honey locks moisture into skin cells. It’s also filled with nourishing nutrients and powerful antioxidants that prevents premature aging as well as keeps skin healthy. Raw honey is soothing and helps calm skin inflammation caused by eczema and psoriasis. It’s also useful against acne because it contains strong antibacterial & anti-inflammatory properties which help disinfect acne prone skin and diminish the appearance of acne. ➝ Lavender Essential Oil – A must-have essential oil in every household, lavender essential oil has many beauty benefits for skin and hair including calming redness & inflammation, soothing rashes and inflammatory skin conditions, improving blood circulation, fighting germs that cause acne and so much more! It also mixes very well with shea butter and has a lovely scent! ➝ Geranium Essential Oil – Geranium essential oil has a beautiful flowery scent and is has a balancing effect on the body, mind and spirit. 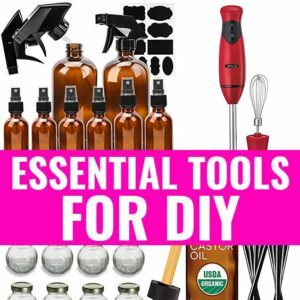 It has lots of beauty benefits including: healing acne, soothing inflammation, calming redness, fighting bacteria, treating ingrown hair and so much more as you can read in this post. ➝ Tea Tree Essential Oil – Being a powerful disinfectant, tea tree essential oil makes this shea butter and olive oil mix for skin great for all skin types. It wards off bacteria, germs, pollutants and irritants that cause rashes, pimples, acne and fungus on the skin. Tea tree essential oil is also good for treating ingrown hairs and curing popped pimple wounds. ➝ Rose Hip Oil – This oil is just POWERFUL for fighting fine lines and wrinkles as well as keeping your skin looking firm and supple. Rose hip oil is extracted from the hip of the rose (the fruit that remains behind when all the petals of the rose wither away) and it contains a high amount of vitamins such as Vitamin E and C. Vitamin E helps protect skin from free radical activity and sun damage while vitamin C boosts collagen products and keeps mature skin healthy. Rose hip oil also contains essential fatty acids that moisturize skin and repair damaged skin tissue – that’s why it’s one of the best oils for scar fading and treatment. Silky skin shea butter olive oil mix! You gotta try it out! 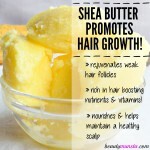 If the shea butter is hard, place the jar/container in a bowl of hot water to loosen up. Once it has softened, whip it for a minute using a hand mixer till its fluffy. Add the olive oil and rose hip oil and blend again till well mixed. Next, add the raw honey and 1 tsp of corn starch and blend well till everything is fully incorporated and the mixture resembles whipped cream. You can now add in the essential oils and stir well. Your shea butter and olive oil mix for skin is now ready! Transfer to a clean sterilized mason jar and store in a clean dry place. Slather It On the Right Way! To use this shea butter and olive oil mix for skin, scoop out only a pea sized amount with clean fingers and massage it onto your face after cleansing it, preferably at night because this is the time the skin regenerates and heals itself. Apply a bigger amount for your whole body after a shower for smooth skin. Use as a frizz-fighter or hair moisturizer to retain moisture in your lovely natural hair! 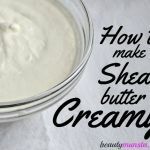 Do you love shea butter and want to make your own beauty products with it?! 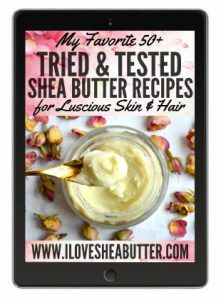 Check out this ebook “My Favorite Tried & Tested Shea Butter Recipes for Luscious Skin & Hair” for 30 awesome recipes, complete with step-by-step instructions, beautiful pictures and other valuable shea butter info! 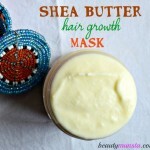 What’s your best shea butter mix for skin/hair? Please share in the comments below! I’d love to hear from you, lovelies!